It was only last week that we looked at the sad demise of Readness, a promising service that allowed users to share the news articles they were reading in real-time. Now, a new experimental project shows that the idea lives on. 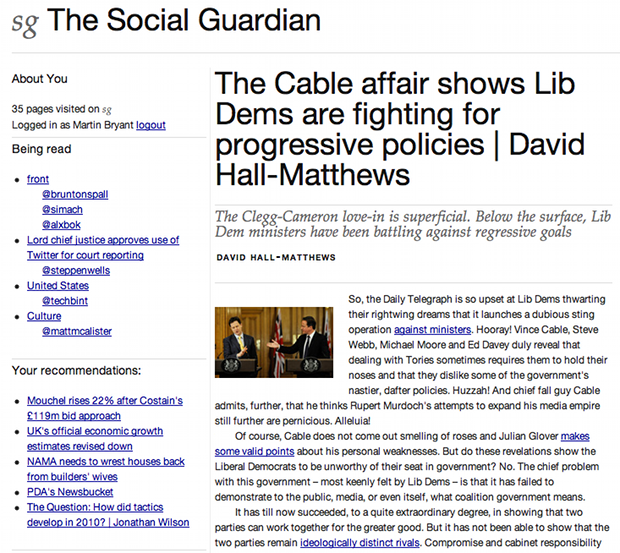 The Social Guardian has been built using The Guardian’s API and while it looks quite plain, it’s actually an brilliant idea. Logging in to the site with your Twitter account, you can see what other Twitter users are reading using the service, refreshed in real-time as they load new articles. A feed updates the page with the latest content from The Guardian website and it’s easy to see what others are reading. As you read articles, the site offers up personalised recommendations of others you might like. While the site is an unofficial, experimental project, it shows what newspaper websites of the future could be like. While it’s possible to bolt social recommendation onto content-based sites using Facebook Open Graph, an approach more tailored to a site’s may well be preferable to many publishers. 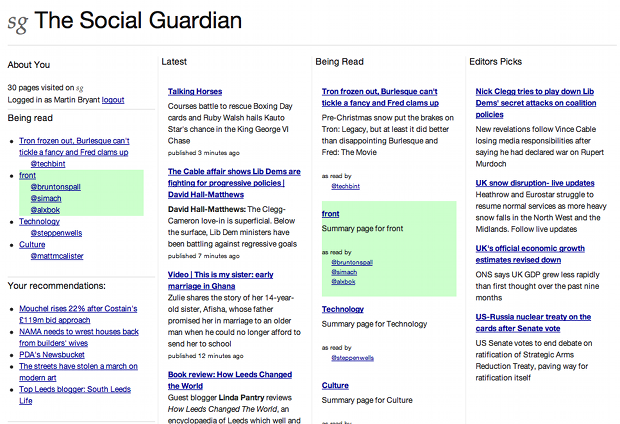 The Social Guardian is just one of a number of interesting, experimental projects developed using the Guardian’s API. 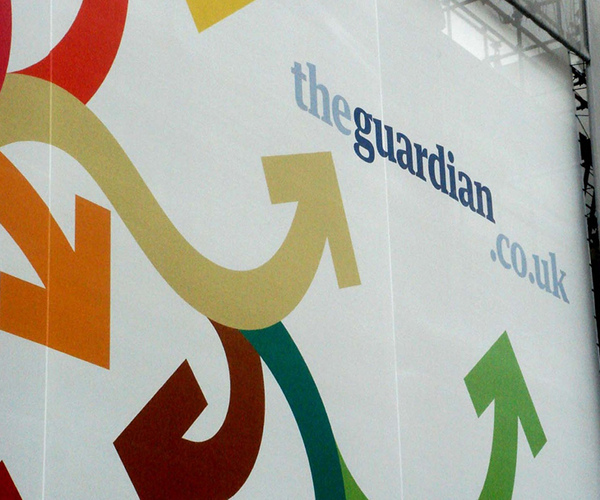 Earlier this year we were impressed by Today’s Guardian, a website that reimagines the newspaper’s content in a tablet friendly, one-article-per-page format. 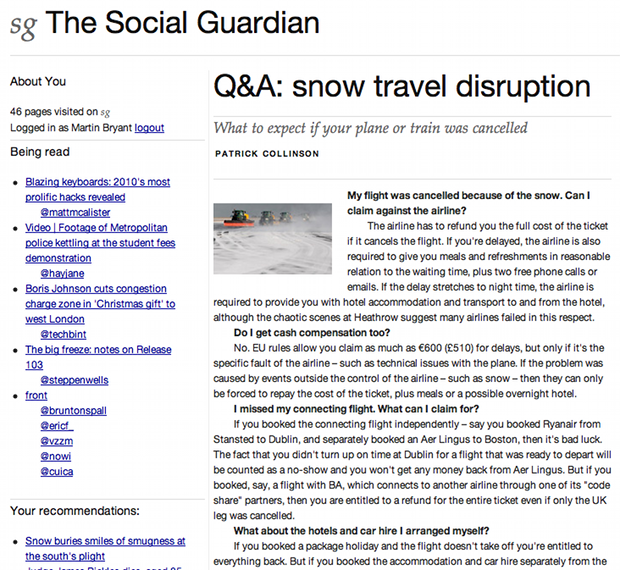 While you shouldn’t expect The Guardian’s own website to adopt social sharing features like this in the near future, it’s an interesting prototype of the kinds of social features news websites could have in the future.